My friends Gina and Rachelle do little blog updates periodically on things they are doing and loving at that moment. Since I got some responses on my reader survey that included more lifestyle posts, I thought it would be nice to start today. I've joked about this before, but these jeans are my absolute favorite. I can't take them off. They are soft as can be, fit like a glove, have only slight distressing, and are the perfect wash. I hope you don't mind seeing them so frequently, but I can't help myself. The price is right, so I highly recommend them. Lunch is my favorite meal of the day, and I prefer a hearty salad with lots of veggies and just a simple drizzle of olive oil and vinegar. This picture was taken a few months ago at our favorite restaurant, but it's what I replicate at least three days a week at home because it's so simple. I just use whatever produce we have on hand, mostly tomatoes, cucumbers, onion, avocado, olives, peppers, feta cheese, and chicken pieces we grill on Sundays. 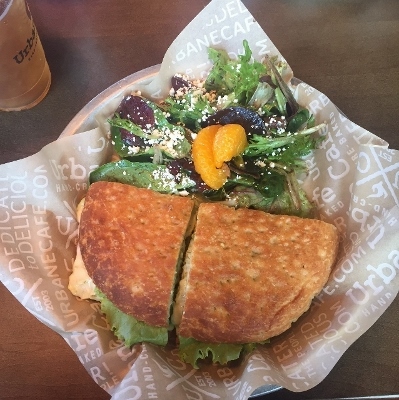 I also must eat a sandwich once per week, and I discovered a place here in town that has great options called Urbane Cafe. Intervention - To feed my fascination with addiction and mental health. Disappeared - Although this show breaks my heart, it's a great reminder that tomorrow is never promised. People go missing under suspicious circumstances every day, and sadly many go unsolved. Housewives of BH and NY - Obviously fun, neurotic, over the top, funny, embarrassing, superficial, and absolutely entertaining! Nate and I are going camping in Lake Isabella for our friend's birthday the last weekend of this month. We are taking the essentials: our jeep, our dog, and his parent's trailer so we can enjoy amenities. You know, like an actual toilet and running water. It's not really camping I guess, but it's something that all of our friends enjoy doing because it's a great excuse to get together, be out in nature, and the kids and dogs love it! Then the next weekend in May, my best friend is celebrating her birthday and I of course will be there with champagne in tow. Okay, now let's talk about my reader survey results! I just want to express my sincere gratitude for the responses I received and for those of you who took the time to complete it. *Most of you have been following me for over one year. *The age range of my readers goes from 25 to 45. That's quite a span and I appreciate your support so much! *Most of you enjoy seeing my style, but I did also get requests for more beauty and lifestyle posts. One person would like to see home decor, but I'm a terrible decorator (I just choose things I like with no real direction) but I will try my best to figure out how to incorporate that topic. I also had a reader comment that she would like to know more about my growing family when that happens, but on the other side, one reader strongly requested that I don't post about children at all. That made me laugh because I don't plan on turning this space into a mom blog. I'm sure I'll do little updates here and there but don't expect too much. *As for sponsored posts, the vast majority of you don't mind them as long as they are relevant to beauty and style. You won't see me shilling feminine hygiene products or alcohol, although I'm still waiting for a La Croix/Perrier sponsorship 😉 That's not a joke. *Lastly, you guys want me to post three days a week, ideally. I'm not sure I'm interesting enough for that, but I will do my best to keep a set schedule and do more when possible. I've decided that I will post on Mondays and Wednesdays, with posts also on every other Friday beginning next week. If I go back to Tuesday, Thursday I will make that clear. That's it for now, have a great rest of your week! you have lots of fun stuff coming up and love this little update. Ok I almost never eat sandwiches, I got veggies patties and they've been in my freezer for months. Thank you Rachelle. I've always loved sandwiches, ever since my mom made them for to take to school as a little kid. I try to eat healthy options, like no mayo just mustard. No dressings either. And loaded with meat and veggies. I love your salmon colored pumps, they are so pretty and the cut is fabulous. Thank you :) These pumps are so cute and comfy, and you're right - the color and cut make all the difference! As for my survey, I do agree that people should blog what they want to, otherwise you run the risk of burning out. But I also want to make sure that people are happy to stop by because they enjoy my content, otherwise I'm blogging for myself. Which is fine of course! But I do cater a bit to my readership. Oh, and I do love a good martini lol. I also love wine <3 I'm just not sure I'd feel personally comfortable being sponsored to feature those things here. But no judgement to those that do! 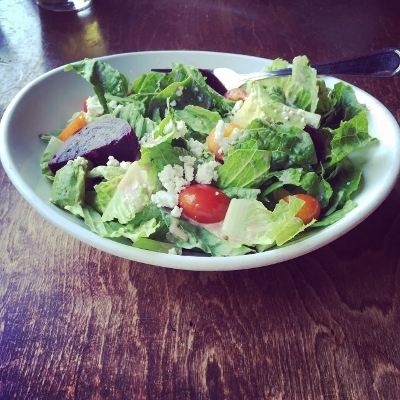 Loved the update and reading the results of your survey - I want to try make that salad you shared! Hey I'm basically doing the same type of post today! I love these little snippets of people's lives so keep them coming! Loved reading your life update and your reader survey results!! Those are always fascinating to me even when they are not my own readers. I definitely hope to see more posts like this from you!